Edward Garston, Senior Associate and Head of Company and Commercial at Pinney Talfourd has been named 'Individual of the Year 2019' (Outer London) in the Company and Commercial category of the Legal 500 UK Awards 2019. The awards recognise the very best firms and individuals in the legal industry and delivered one of their coveted trophies to Edward at a glittering ceremony at London Guildhall on 6 February 2019. Edward is Head of the Company and Commercial Team at Pinney Talfourd and was awarded "Individual of the Year 2019" for his outstanding results over the course of 2018. Edward was recognised for his dedication to assisting businesses with their corporate and commercial legal requirements, which include the acquisition of other companies and interests, company reorganisations, and providing specialist advice to company shareholders. The event was attended by the country's top lawyers, barristers, and in-house counsel. A shortlist of contenders was announced in December and consisted mainly of senior figures from some of the largest national and international law firms. Edward beat off fierce competition from colleagues in other well respected firms including Eversheds, Pennigton Manches and Squire Patton Boggs, to take home the trophy. Rarely has such a prestigious honour been awarded to a solicitor from a regional practice. Edward was the only individual from Essex to be shortlisted. Commenting on the award, Pinney Talfourd's Managing Partner Philip Cockram noted "With such a high entry standard, we are immensely proud of Edward's achievement. His growing team are well known throughout the local area as the "go-to" company and commercial specialists, and this award recognises his strength in this specialist field". Adding his own views, Edward said "I was absolutely delighted to receive this award. It is such a huge honour to be recognised for my work helping businesses through some often difficult and strategic business developments. Even though this is an individual award, I'm extremely fortunate to work with an equally talented and professional team who regularly deliver results for our clients". 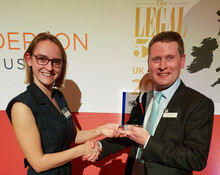 All shortlists and winners were decided using the Legal 500 UK applications, in which the Company and Commercial Team are ranked and Edward is personally named a Next Generation Lawyer. Legal 500 UK is widely recognised as the definitive guide to law firms in England and Wales and available online for clients’ reference. Pinney Talfourd has offices across the South East covering areas including Upminster, Hornchurch, Brentwood, Leigh on Sea and Canary Wharf. The Company and Commercial Team pride themselves on offering a bespoke and practical service which is delivered in a practical and cost-effective manner.